The Truck King Challenge does “real world testing” in order to determine which truck will come out on top. 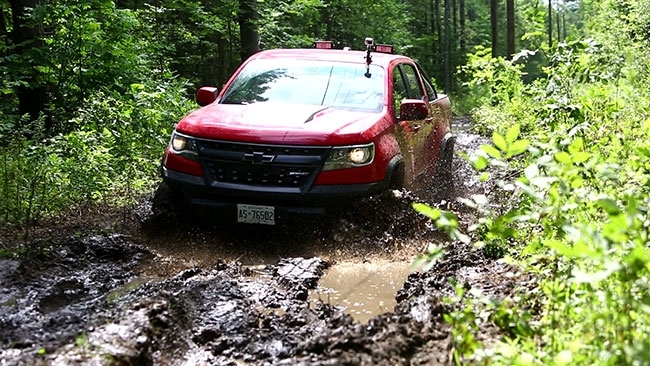 The judges, a group of automobile journalists, drive the trucks on a course with no payload, then with payload, and finally towing a trailer – all on the same route, one after the other, back to back. Judges drove more than 3 The Truck King Challenge does “real world testing” in order to determine which truck will come out on top. Judges drove more than 3,000 kilometres while scoring each truck across 20 different categories. The totals are then averaged across the field of judges and converted to a percentage (included beside each truck name below). Toyota Tacoma TRD Pro (66.4%) – 3.5L V6 Atkinson cycle engine, 278 horsepower, 6-speed automatic, 4WD, double cab. Special features included all-terrain tires, aluminum skidplates and Fox racing shocks. Payload limit: 1,000 lbs. Bumper tow limit: 6,400 lbs. Price as tested: $53,295. Ford F-150 FX4 Platinum (75.6%) – 5.0L V8, 395 horsepower, 10-speed SelectShift automatic, 4WD (2-speed transfer case; electric rear locker) crew cab. Special features included auto stop/start standard, adaptive cruise w/pre-collision. Payload limit: 3,270 lbs. Bumper tow limit: 13,200 lbs. Price as tested: $78,699. Chevrolet Silverado Z71 1500 LTZ (71.4%) – 5.3L V8 Ecotec3 with cylinder deactivation, 355 horsepower, 8-speed automatic, 4WD (2-speed transfer case), crew cab. Special features included Rancho shocks, underbody shield, hill descent, Wi-Fi. Payload limit: 2,120 lbs. Bumper tow limit: 11,700 lbs. Price as tested: $65,075. Ram 1500 Limited Tungsten Edition Crew 4×4 (75%) – 5.7L Hemi V8 with MDS, 395 horsepower, 8-speed TorqueFlite automatic, 4WD (2-speed transfer case; anti-spin rear diff), crew cab. Special features included four corner air suspension, RamBox. Payload limit: 1,388 lbs. Bumper tow limit: 7,970 lbs. Price as tested: $74,550. 4×4 Toyota Tundra DBL Cab LTD (65.7) – 5.7L i-Force V8, 381 horsepower, 6-speed automatic, 4WD (2-speed transfer case, limited slip diff), double cab. Special features included a 144L fuel tank. Payload limit: 1,500 lbs. Bumper tow limit: 9,899 lbs. Price as tested: $55,690. 2018 Nissan Titan Pro 4X (68.5%) ¬ 5.6L V8, 390 horsepower, 7-speed automatic, 4WD (2-speed transfer case, limited slip diff), crew cab. Special features included pro 4X off-road package. Payload limit: 1,610 lbs. Bumper tow limit: 9,230 lbs. Price as tested: $63,050. 2017 Ford F250 FX4 Lariat (no changes for 2018) (75.3%) – Power stroke 6.7L V8 turbo-diesel, 440 horsepower, TorqShift, six-speed, SelectShift automatic, 4WD with selectable 2-speed transfer case, crew cab. Special features: FX4 adds off-road tires and underbody protection. Payload limit: 3,350 lbs. Bumper tow limit: 17,600 lbs. Price as tested: $92,364. Chevrolet Silverado 2500 LTZ Z71 (80.7%) – Duramax 6.6L V8 turbo-diesel, 445 horsepower, Allison six-speed automatic, 4WD with two-speed transfer case with hill descent control, crew cab. Special features: Z71 adds off-road tires, skid plates and Ranchero shocks. Payload limit: 2,513 lbs. Bumper tow limit: 13,000 lbs. Price as tested: $79,805. Ram 2500 Limited Tungsten Edition (72.4%) – Cummins 6.7L I6 turbo-diesel, 370 horsepower 6-speed automatic,** 4WD with two-speed transfer case, crew cab. Special features included auto-leveling rear air suspension. Payload limit: 2,380 lbs. Bumper tow limit: 17,160 lbs. Price as tested: $92,105. The 2018 Silverado HD came equipped with a new generation of the 6.6L V8 turbo-diesel. It’s been redesigned with a new cylinder block and heads. Its oil and coolant flow capacity has been increased and the turbocharging system is now controlled electronically. Horsepower has increased and torque now reaches 910 lb-ft. Ninety per cent of both numbers are achieved at just 1,550 rpm. The new Duramax cold-weather performance engine requires less than three seconds to preheat in temps as low as -29 C.
Also new is a redesigned air intake system, which uses an integrated hood scoop that traps snow, sleet and rain, draining it away from the breather, allowing cool dry air to get to the engine without clogging. The large number of electronic driver assist features that make moving loads easier and safer overall. These new updates include the new digital steering assist that improves road handling and a new tire pressure monitoring system with a tire fill alert. The driver alert package includes lane departure warning, forward collision alert, a safety alert seat, and front and rear park assist. General Motors’ long-time StabiliTrak stability control system has been updated to include rollover mitigation technology, a tie-in to the trailer sway control, and hill start assist. A camera system broadcasts on the Chevrolet MyLink touchscreen. Reversing images make hooking up easy, while a view around the truck assists in parking. Turn signals now activate cameras in the mirrors showing images down the side of the truck, highlighting the blind spot. Other improvements include a gooseneck/5th wheel trailering prep package that includes a spray-in bedliner. Electronic upgrades include wireless phone charging and remote locking tailgate and 4 LTG Wi-Fi in the cab. *Manufacturers supplied trucks of their choice and decided which trim or accessory package to apply, as well as the choice of engine. ** Ram still offers a six-speed manual.